Ultra-Pro II Seam Ripper & Buttonhole Cutter Scissors for fabric, quilting, embroidery and more at Havel's Sewing. Your source for unique tools for your fabric arts. One of our most versatile cutting tools! With one handle you can have either a seam ripper or a buttonhole cutter at a moments notice. Blades are easy to put on and change with the screw-lock handle, and each handle comes with one safety cover. 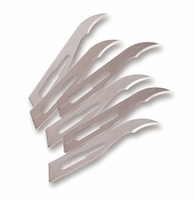 Set includes 1 handle, 4 seam ripper blades, 2 buttonhole cutter blades, and 1 safety cover. (For replacement blades, see item #18906 and item #18936).